Fifteen years in development, Rodrigo Garcia’s adaptation of George Moore’s short story The Singular Life of Albert Nobbs arrives on the back of two deserved Oscar nominations for stars Glenn Close and Janet McTeer. And while it’s just the sort of film Hollywood likes to embrace, one can only imagine the horrific hash a studio would’ve made of telling this sensitively told tale. Set in Dublin in the 1890s, Albert is a dedicated waiter who works and lives in a hotel owned by the genial Mrs Baker (Pauline Collins). Albert has two secrets: one is a stash of cash hidden below the floorboards in his room, diligently saved to fund a lifelong dream of owning his own shop. The other is that he’s really a woman, a secret Albert has held onto for 30 years. Played by Glenn Close, who first played Albert on stage in 1982, Albert’s rigorously ordered life is thrown into turmoil when Mrs Baker employs a painter named Hubert Page (McTeer) for a job, and instructs Albert to share his bed with Page for the night. Page swiftly discovers Albert’s secret only to then reveal, quite literally, that he too is a woman (in an unintentionally comic moment that causes Albert to almost faint). 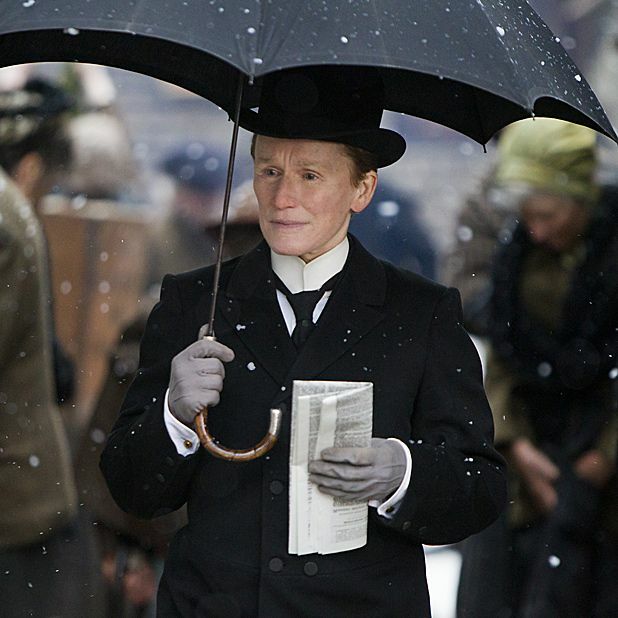 The real shame, after such an intriguing set-up, is that Albert Nobbs never really pays off. With Albert pining after fellow waitress Helen (Mia Wasikowska), who’s already embroiled with the hotel’s volatile handyman (Aaron Johnson), the script from Close and novelist John Banville lacks real impact in its final act. While this tale of women forced to suppress their very essence is an undoubtedly sad, strange and frequently touching one, it’s also often a very emotionally inert work – as tightly wrapped as Albert himself. And it really doesn’t help that all this cross-dressing makes you think of a bad Monty Python sketch. Selected release from Fri 27 April. In 1890s Dublin, Albert (Close) is a hardworking waiter in a hotel who has concealed for years the fact that he's really a woman – only to be found out by fellow employee Hubert (McTeer), who is also one. A sad, strange and touching tale, which however never really pays off.